Saturday, October 17 was a day completely consumed in travel. The plan was to make my way from Yangon, Myanmar to Colombo, Sri Lanka. The infamous carrier Malaysia Airlines on which I would be traveling cancelled the route for tickets I had already purchased. The replacement tickets changed my arrival time in Colombo by eight hours later, causing me to lose time in Sri Lanka. About 12:35 p.m. local time in Yangon, I traveled by taxi the great sum of less than two kilometers from my hotel to the airport. As it turned out, I paid more for a 12 ounce can of Coke Zero in the airport than it cost for the taxi to get to the terminal. All formalities for my departure from Myanmar accomplished, I boarded my first of two planes at 3:45 p.m. With the help of gate personnel, though, I almost made a huge mistake. I thought it was early for my flight to board, and it was, but a young lady gathered up people around the gate and herded them into the queue or line for immediate boarding. Fortunately, the ticket-taker stopped me from getting on an airliner bound for Viet Nam! Finally seated on the correct airplane later, it carted me to Kuala Lumpur, Malaysia after a flight of approximately three hours, providing me my first visit to that airport and country. Modern mall-like amenities there were limited mostly to chocolate or booze. The two restaurants from which travelers could choose majored for the one in pastries and the other in rice dishes. 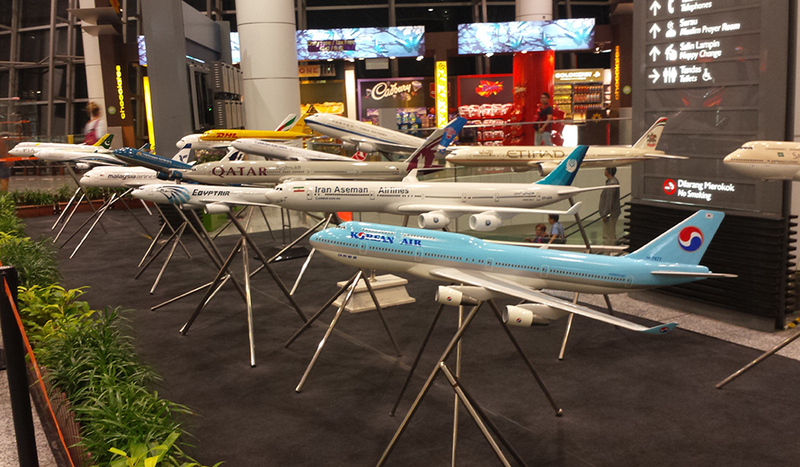 I made no purchases in Kuala Lumpur before departing by air at 11:03 p.m. local time for Colombo. Somewhere around three hours later my plane landed in Sri Lanka at about twenty minutes to midnight. Minor difficulties with electronic communication only briefly interrupted my retrieval and travel by taxi to the home of brother Harold and sister Lilani Thomas. Sister Thomas had commissioned a taxi driver to pick me up, and so she called him and asked him to pass his phone to me for voice recognition and confirmation that the driver was not bringing a stranger than expected man to her house. If I had had a sore throat, she might have had the taxi driver put me out along the road – where I might still be trying to find my way. There is absolutely no one else on the planet who has the infectious and uplifting laugh of sister Lilani. I can do voice recognition, too! The Thomas’ are gracious hosts and friends in Christ. It was about 2 a.m. by the time I showered and got into bed for the night. I had been unable to sleep well Thursday and Friday nights, but I had slept as best one can sitting upright in an airplane seat, sometimes feeling like a rider in a sardine can with wings. Still, I was able to go to sleep in the bed for what time was afforded before rising at 6:30 a.m. Colombo local time. The Shrubbery Garden Church of Christ is a remarkable congregation from so many perspectives. Christians begin showing up 45 minutes before commencement of worship. Once worship begins, two songs, prayer and the Lord’s Supper use up a full hour on the clock. Next, the preacher is expected to preach for another hour! Since the church had been exploring a series on Jesus Christ, I preached my lesson “The Deity of Jesus Christ.” However, since the Shrubbery Garden church is comprised of English, Senegalese and Tamil speakers, a brother, a former Anglican priest, translated for me. Like back in the American southern states, me being a northerner, I nearly need a translator from English to English, too! 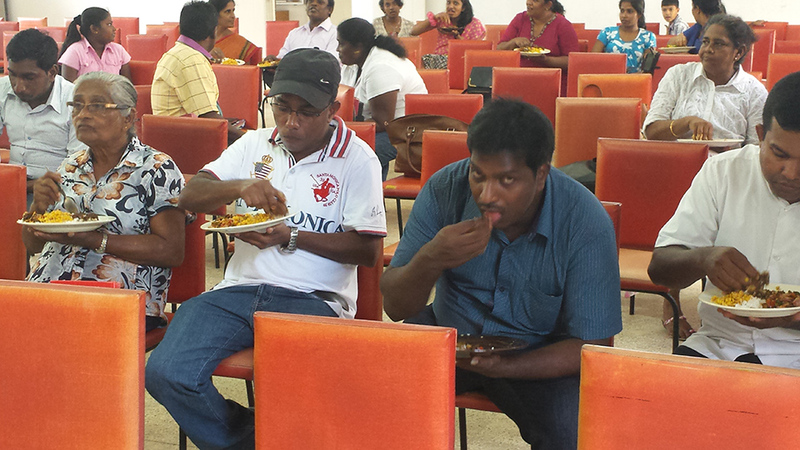 Following worship each Sunday morning, the church breaks for tea – but really for a full meal. Typically, a class of an hour or so follows that. Finally, when class is over and much time has passed, church leaders have to tell the many lingerers to “go home and come back Wednesday.” Brethren need to be ushered out the car gate, and it needs to be closed. The earnest desire to be with fellow Christians, arrive early and leave late, to have to be encouraged to leave is a devotion to God that we in American congregations would do well to develop. Apparently at least on Sundays, it is the local custom to take a nap. I was all too ready to visit my bed once more, though only for an hour or so to keep from ruining the upcoming night’s rest. Supper is later here than any place in America – 8:30 p.m. However, I envision that the beef stew for which my mouth is watering will be well worth the wait. As I pen this, I am also anticipating my onward travel tomorrow to New Delhi, India. There and beyond throughout India I will teach and preach the Gospel in several locations over the next four weeks, Lord willing, of course. There is no place I would rather be than doing what I am doing, trying to encourage and edify brethren while at the same time attempting to glorify God. Anyway, I need to be busy for the Lord as much as possible because every idle moment right now is not my friend, but my enemy as I continue to try and come to terms with the loss of my Bonnie. Please pray for me for the sake of the Lord’s work in which I attempt to have a small part wherever I can. 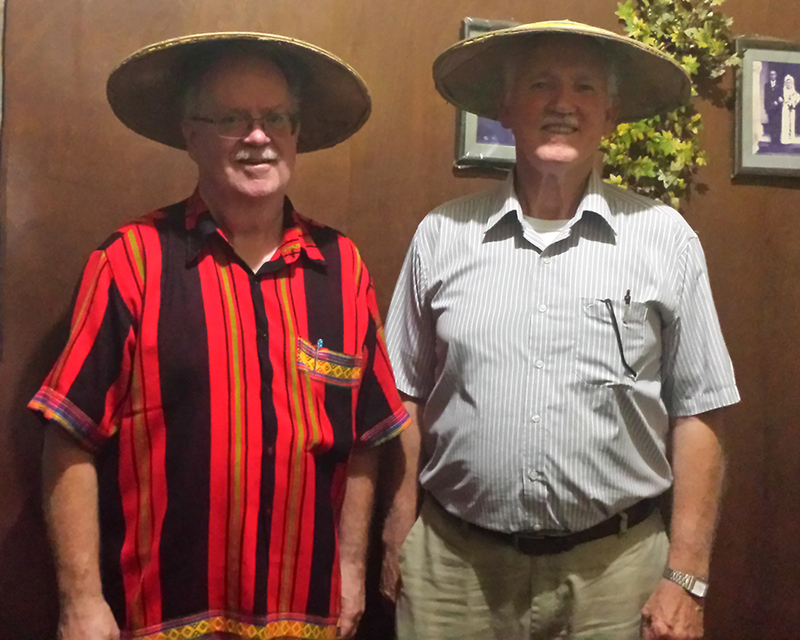 This Friday, October 16, 2015 I am winding up my three-week stint in Myanmar. Tomorrow afternoon I wing my way first to Kuala Lumpur, Malaysia. After a three-hour trip to there and a three-hour layover, Lord willing, I will continue onward for three and a half hours to Colombo, Sri Lanka; I should arrive there five minutes before midnight. I will not get to bed down until the wee hours of Sunday morning. Thursday at the end of the day, we took picture after picture with camera and camera phone after camera and camera phone. We took multiple group photographs of the assembled teachers and students, plus innumerable quick shots of various ones with brother Damon Vincent and me. Friday before we could depart, brother Damon and I were amply appreciated in a prolonged speech and subsequent translation. Then, with the beautiful and harmonious Burmese voices I have always adored they all sang us goodbye. For supper, I persuaded sisters Winsome and Sheila, our mother-daughter hosts for dinner meals, to have our annual Asian-American meal in their home where we eat together instead of eating while they serve and administer the meal to us. This year, we didn’t buy any pasta, but we purchased milk and processed cheese out of which I made a cheese sauce that we stirred into the white rice. That’s all it takes to alter the polite custom enough to have these dear ones join us, and still, Winsome was like a butterfly flitting here and there seeing to our every perceived need. It was good for me to be here, and I hope that my presence these three weeks has resulted in glorifying God first, and secondly in edifying those with whom I came in contact. Over the last few days, I have heard so many firsthand accounts of how over the generations precious souls came to become Christians in Myanmar. Today, I learned of a brother who back in 2008 attended the Hmawbi Bible School while he was a Baptist preacher. He was angry, he said, when he heard about the divine organization of the Lord’s church and how denominational organization was incorrect. However, he came to realize the difference between the ways of mankind and the divinely authorized organization of the church of the Bible. He became a Christian in 2008 in the second session that year, and he is an active Gospel preacher now. Nearly a third of the students this year are Baptists, and we hope that they have been favorably impressed with the Word of God; they voluntarily came a long way deliberately to devote five weeks of their lives to studying the Scriptures with us. The Burmese brethren, representing a number of tribes within Myanmar, haven’t and don’t always get along. Of course, that wouldn’t happen in America among our brethren, or would it? I am happy to say that this year it is clear to see that Christian brethren are working wonderfully well together and cooperating with each other for the furtherance of the Gospel of Christ and the extension of the Lord’s kingdom. It would be difficult to find Christian brethren anywhere in the world who are more evangelistic than these dear ones in Burma, despite the hindrance of being in a decidedly Buddhist nation, which is sometimes hostile toward non-Buddhist religions. I could not be more proud of my brethren and Christian friends here. Thank you, those of you responsible for me being here, for allowing me to serve in this wonderful, fertile field of labor. Sunday morning October 11, brother Kyaw Sein sent his car after me to transport me from my hotel in Yangon to his home in the Hmawbi jungle. There several Christians assembled for Lord’s Day worship, and it was my pleasure to present a message from God’s Word (“Redemption, Forgiveness, Justification & Sanctification”). It is always a joy for me to worship Almighty God in spirit and in truth with brethren wherever I find them across the globe; today was no different in that respect. What serves as the living room turns into a dining room for meals, too. On Sundays, though, the same space becomes the assembly place for Kyaw Sein’s extended family, neighbors and friends. Upon my arrival, I attempted too soon to snap a picture of brother Sein and myself – before the camera lens had time to make the adjustment from the air condition car to the humid tropical surroundings. Hence, that’s the reason for the blur. Notice, however, the traditional dress that he and I are wearing, and I am wearing an Asho tribe shirt, too. In his arms you can see the copy of Vine’s Expository of Old Testament and New Testament Words that I gave him that morning; he will make good use of it in his personal studies and translation work that he does. Following lunch of spaghetti, fruits and juice, I was ferried back to my Yangon home away from home. Monday, brother Damon Vincent and I rode a taxi the 45 minutes to an hour to the Hmawbi outskirts, to the Hmawbi Bible School – and beyond for me. While brother Vincent taught in the morning at the school, I taught Christians, denominationalists and Buddhists at the Sein home. By request, I taught my tracts Salvation Summarized and Foul Language. Brother Kyaw Sein (pronounced Joe Sane) and one of his fleshly brothers (siblings) are translating some of my tracts into Burmese, after which those tracts will be printed and distributed. At noon, I returned to the school, ate my lunch with the students and staff, and prepared to teach afternoon classes there. In response to a question days earlier by a Burmese evangelist present, I taught a lesson from one of my sermon outline books about “The Deity of Christ.” This was of interest in preparation for conversing with Jehovah’s Witnesses and trying to lead them truly to Jesus Christ. Tuesday was a day of adjustments, requiring a certain amount of flexibility. First, the hotel neglected to bring me any breakfast, such as it is – two slices of toast, a fried egg, a cup of warm tea and orange drink. (While the dining room is under construction, the hotel brings breakfast daily to one’s room – or that’s what is supposed to happen.) Next, my class at the home of Kyaw Sein was cancelled for the day. Therefore, I opted with the approval of brother Vincent to stay in my room and work my mobile office while he taught both morning and afternoon classes at Hmawbi Bible School. I had planned to venture out on foot to get some groceries and some lunch, but heavy rains convinced me to remain in my room and make do with two small apples, some crackers and spray cheese and a couple of cereal bars in place of breakfast and lunch. Upon leaving the hotel for supper with Winsome and Sheila Vertannes, I inquired about no breakfast, and I requested my room to be sprayed for mosquitoes and to have the room made up since that had not occurred during the day either (i.e., clean towels, etc.). Sadly upon my return later, neither had the room been made up nor had towels been replaced, and not even the trash was emptied. Just to round things out, when I turned the AC on, it began to chew itself apart – making the worst loud noise; now no air conditioner. Children and adults play and shout outside my window in the narrow way between two buildings. The blast of the front desk phone sounds off a few feet down the hallway. I hope that there is enough water pressure to shower tonight. The work is tedious, but I did manage to make significant progress on preparing literature for publication. There is still a long way to go before this particular material will be ready for public use. During the day, I worked, I rested and I have had a little bit of a crabby attitude. (Some loneliness visited me as well a little bit this day.) Fortunately, being alone, I didn’t have any arguments with anyone! I know the blessings are bountiful, and furthermore, I am wonderfully blessed to have these opportunities to serve our Lord. Some of you make that possible. No sacrifices are being endured here in these things, only some inconsequential inconveniences from time to time that pale in comparison of the reason for being here and elsewhere where opportunities for Christian service present themselves. The week has all but ended; maybe four hours from now I will turn in for the night and sign off from Yangon, Myanmar (Burma). Looking back over the week, I preached for two congregations on Sunday and taught four hours daily Monday through Friday at the Hmawbi Bible School, some 45 minutes to an hour from Yangon in a jungle setting. Lessons preached and taught include: “Redemption, Forgiveness, Justification & Sanctification”; “Male Leadership in the Home”; Male Leadership in the Church”; “Worship in the Small Congregation”; “Decision Making without Elders”; “Organization and Operation of Congregations without Elders”; “How to Train Members to Become Elders and Deacons” and “The Ministry of Preaching.” I also worked on Gospel Gazette Online magazine, publishing the October edition to the Internet from my hotel room. This coming week, I plan to teach at least “Basic Principles of English”; “Elementary Greek” and “The Deity of Christ” at the Hmawbi Bible School, plus additional lessons Monday through Friday half days at another location in the outskirts of Hmawbi. Today (Saturday, October 10, 2015), Winsome Vertannes and I ventured downtown to the river port, an excursion that consumed the day. We waited in the longest line of people in which I have ever waited for half of an eternity just to board a visiting book store ship (Logos Hope). Once inside, we were among hundreds if not well over a thousand people crammed into the ship’s interior poring over many thousands of educational, fiction and religious books. We were the proverbial sardines in a can. We waited hours in line again just to make it through a store-long, doubled serpentine line just to get to a cashier. With the Lord’s money made available by donors to memorialize my wife Bonnie, I purchased three copies of Vine’s Expository Dictionary of Old Testament and New Testament Words; there were only three copies available or I might have purchased more. I was also looking for copies of Strong’s Concordance, but I could not find a version based on a standard Bible translation. Though I could have purchased the Vine’s more cheaply in the States, the shipping expenses necessary to get them to Myanmar would have far negated any saving. I will be giving the three books to soldiers of the cross in Myanmar to assist them in their labors for our Lord. 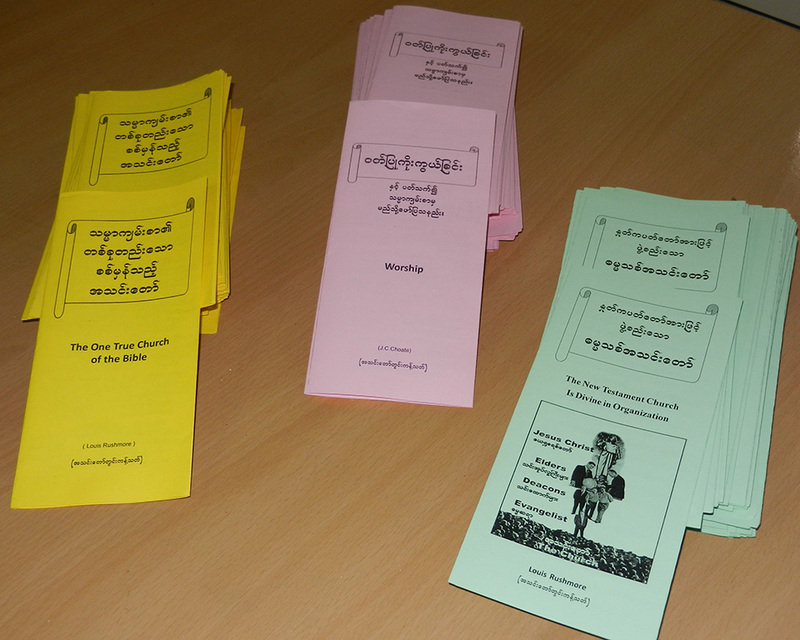 Earlier in the week, two of my tracts and one tract by brother J.C. Choate were translated and printed in Burmese for distribution to attendees at the Hmawbi Bible School and to a faithful preacher who labors in the delta outside of Yangon. 1,000’s of readers swarmed the ship. 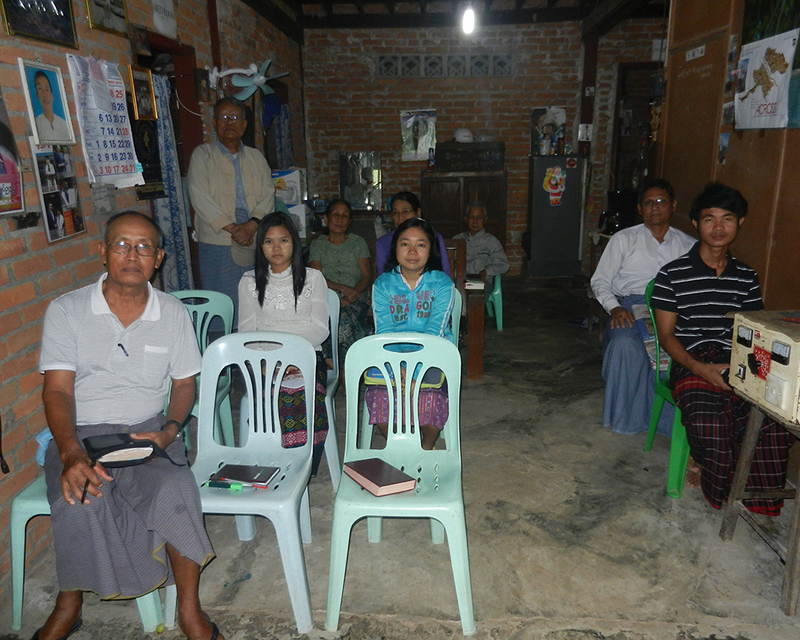 Tomorrow, I will worship with the house church in Hmawbi that meets in brother Kyaw’s home. Lord willing, it will be my pleasure to speak at that time as well. Thank you for your part in putting me for the Lord in this place. May God be glorified and every soul with whom I come in contact be edified. Today (Tuesday, October 6, 2015), I spent the day at the Hmawbi Bible School in its tropical, and today, rainy backdrop. Between yesterday and today, I spent about eight hours instructing Christians and non-Christians about the organization of the Lord’s church. 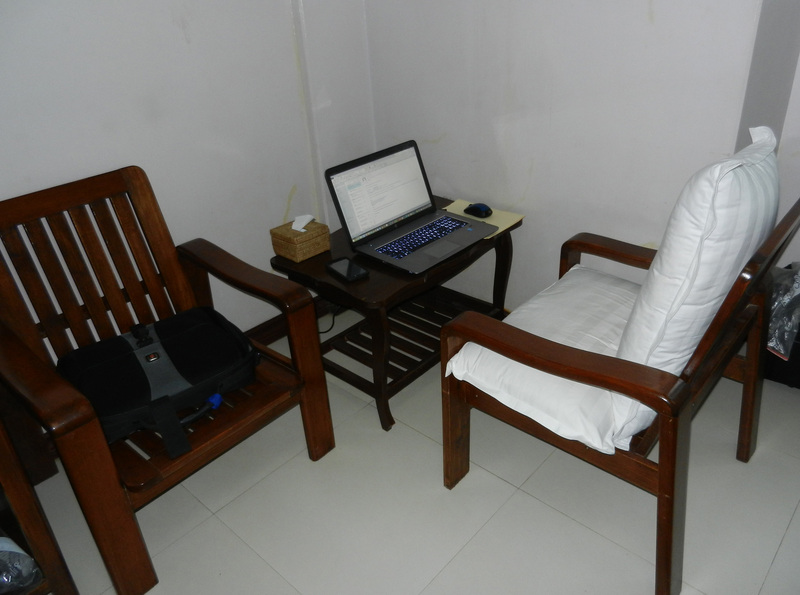 Even one of the Burmese instructors said his understanding of the subject was improved by our investment in this study. We addressed male leadership in the church, the qualifications of elders, the selection and appointment of elders, how a congregation without elders yet can function properly and how female Christians can influence the decisions made by either the adult, faithful male members or an eldership. Supper tonight amounted to a thorn between two roses. As a token of my appreciation and on behalf of my supporters, it was my pleasure to treat my hostesses to a store-bought supper in a nice restaurant not far from my hotel. Sister Winsome and I each enjoyed backed spaghetti with beef meatballs, while sister Sheila had a deluxe noodle and seafood assortment. After cleaning our plates, we split a dessert plate of ice cream, cake and Jell-O three ways. 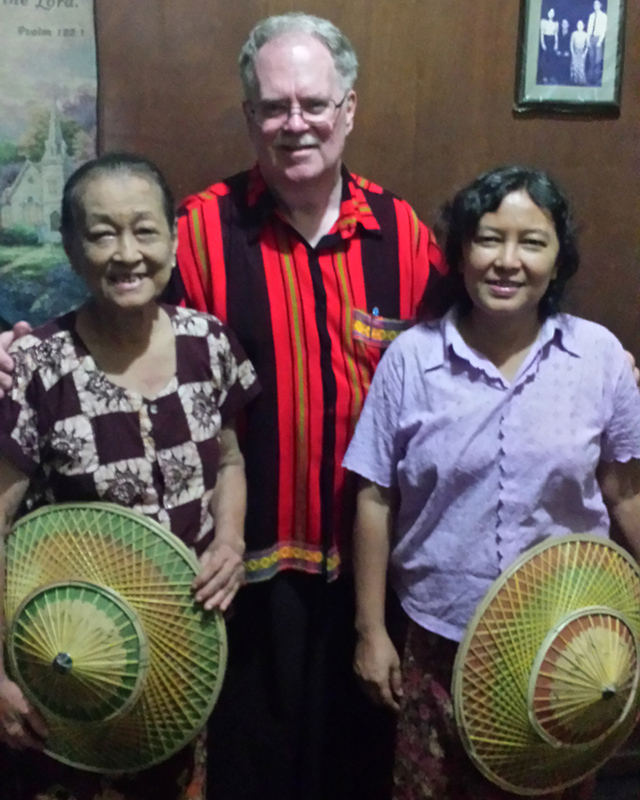 It was a lovely way for me not to spend my evening alone in my hotel room, and this mother-daughter duo cater to and feed the string of American visitors that pass through Yangon and disperse throughout Myanmar during the year for our Lord. Once back in my room, I found the Internet working again, and so I uploaded the final pages of the October issue of Gospel Gazette Online (Website: www.gospelgazette.com) to the Internet. Then, I proceeded to inform the nearly 1,700 subscribers that the newest edition was ready for their use. Each day is full with purposeful activity, and that is just fine with me. Thank you for your prayers and encouragement. We were late arriving at the second assembly and a Burmese preacher was preaching already. Interestingly, he was preaching one of my sermons! 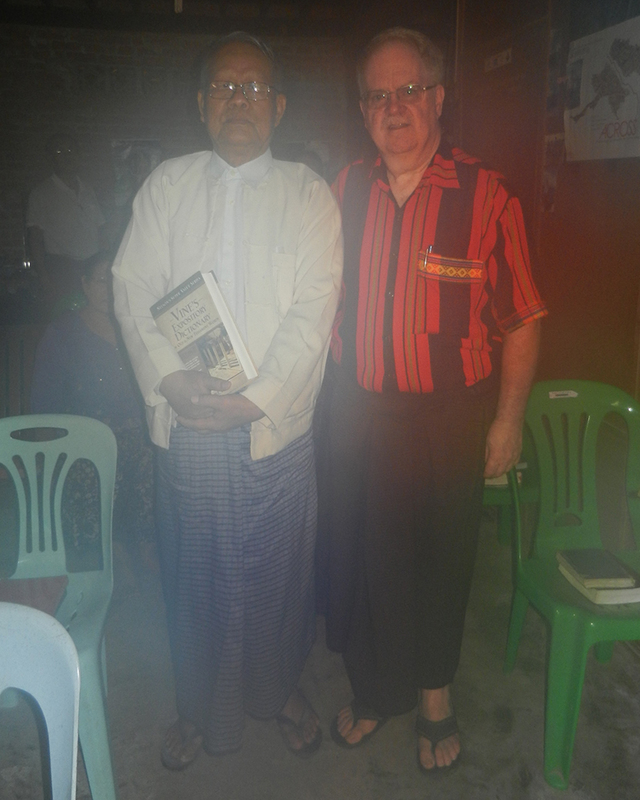 I wrote it in English, and he was reading it in English while preaching it in Burmese. Later, he said that I was his teacher from afar and that though we had never met, he was glad to finally meet me. He has on his computer a large share of the sermons, articles and books that I have prepared over the past 40 years. I am grateful if anything that I have attempted to do in Christian service proves useful and edifying to others as well. Monday, it was my privilege to teach morning and evening at the Hmawbi Bible School in a jungle setting about an hour from Yangon where I am lodging; last night, the mosquitoes got the upper hand, waking me twice from my sleep with their painful bites. About 30 are in attendance this 5-week session at the school, counting students and staff. During our lunch break, I was conversing and enjoying company with dear brethren Simon and Philip, and before I knew it, I was momentarily dislodged from my sullen grief and pain into an audible, noisy laugh. I surprised myself, because I had doubted if I would ever find satisfactory amusement to divert my attention from my loss. I hardly know what to think, and silly as it is, I almost feel a little guilty about it, as if in some way I am being disrespectful to the memory of my Bonnie. Lessons today and tomorrow are about male leadership in the church and especially about elders. In addition, we have and will address how to function in a congregation without elders. Discussed today and planning more for tomorrow, we have noted and will note yet some more that Scripture does not permit women a leadership role in the Lord’s church. Additional lessons this week and next week will speak to making preaching more effective and acquaint pupils some with fundamentals of English and Greek. Back at the hotel between power outages, I am in the final stages of publishing the October edition of Gospel Gazette Online to the Internet. My mobile office – stateside or abroad – travels with me and only requires a little space, occasionally some electric and once in a while a minimally satisfactory Internet connection. Notice in the photo my “desk and chair.” The table is a little low, and the chair is a little hard, until I line it with bed pillows. Actually, the pillows and the bed are somewhat hard, too. Some of you will be pleased that I laughed today, noting how forlorn I have been these short number of months since Bonnie passed away. Not all of my mourning has subsided, but immersing myself in the Lord’s work on foreign soil and renewing friendships among the loved ones here in the faith helps. Others of you will be happy to note that I am attempting to apply myself, whereby God may be glorified and precious souls may be edified. To God be the glory. What’s not to like? Nearly every day since I have been in Asia so far (i.e., Singapore and Myanmar) I have eaten French fries! With a stomach like mine, nursed daily with medicine, the anticipation of spicy Asian diet and sometimes doubtful hygienic food preparation can give rise to some personal anxiety. To date, I haven’t dipped heavily into my store of cereal bars and Ritz crackers. What’s not to like? I sleep in an air conditioned room; when the electric fails, a generator restores power to the hotel. I have a hot shower at my disposal – and a western-style flush toilet. Someone else washes my clothes, unlike at the house when that is my job. Besides tasty meals in local restaurants and the home of sisters Winsome and Sheila, the grocery store is a short walk from my lodging, where just last night I bought all I could carry. Of course, I just got the important stuff, like Coke Zero, orange juice, Myanmar tea, washcloths, professionally packaged cashews and one of the biggest Cadbury milk chocolate bars I have ever seen – enough to last for days! More importantly, I am here for a reason in service of our Lord, and it has been a sheer pleasure to interact with dear, familiar brethren in both countries visited as of yet; I look forward and long also for the sweet friendship of more Christian friends in Sri Lanka and India in the weeks to come. Upon my arrival Monday, September 28, I was greeted by Asia’s Phoebe, sister Winsome; she is the go to person for arrangements for so many foreign and domestic brethren to facilitate our comings and goings for the cause of Christ. The landscape of the Christian endeavors of so many brethren would not be the same at all without her. Tuesday, I was greeted at the hotel by brother Jay Ahti who had traveled an hour to see me, bearing for me more fruit than I could eat in the three weeks I will be in this country; we lunched together nearby at a café in Oceans mall. Wednesday, brother Kyaw Sein from Hmawbi sent a car for me to usher me to his home about an hour away, where we had lunch together and mapped out a strategy for teaching in his neighborhood two weeks from then. Thursday, Jay Ahti returned in a taxi to retrieve me and take me to his home far, far away through thick motorcar traffic in Yangon, a city of many millions. Following lunch, study and provision for participation in his ongoing godly labors, we trudged back to my hotel. 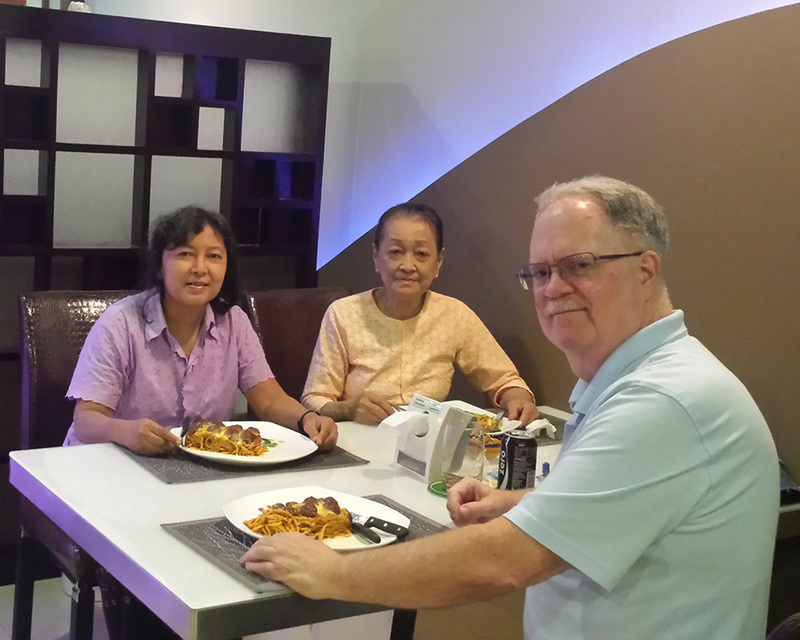 Friday, brother Damon Vincent arrived at the hotel and we communed in the lobby for a while, along with Winsome and Jay Ahti; Saturday morning, brethren Damon and Jay departed for the far northeastern corner of Myanmar to present a series of weeklong lectures to fellow Christians. Saturday, Winsome and I made my annual trek to Scott’s Market in the downtown, whereupon I buy small gifts each year to give away to stateside brethren who extend to me their hospitality as I travel, giving mission updates and presenting biblical lessons. I look forward to the jaunt, and there is always so much more to take in and view beyond what meager purchases I make. Punctuating the above throughout the week, I have set up my mobile office in a corner of my hotel room and applied myself to preparing the October edition of Gospel Gazette Online and beginning to work on a new literature project. Most of the time, the Internet at the hotel works and is barely fast enough to upload html pages for GGO and retrieve my email. As soon as I receive the last two articles for which I am waiting from writers, I will publish the new issue and notify subscribers. 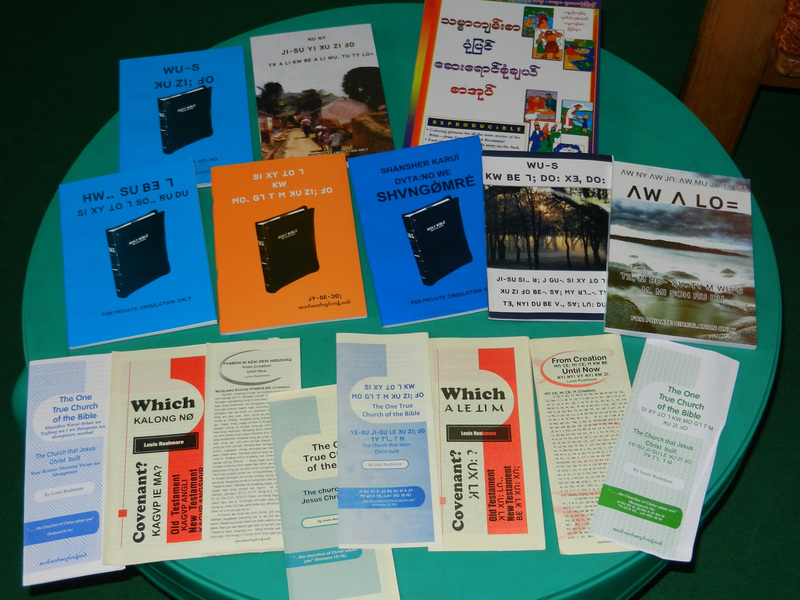 This week, too, through the funds made available by my supporters, I have empowered Burmese brethren with hundreds of dollars to continue printing various pieces of literature; I also gave them new tracts that they may consider for publication in four national languages of Burma. Sunday, as I pen this, I am anticipating worshipping with brethren at two house churches in Yangon, where on each occasion they graciously will permit me to teach God’s Word. Monday through Friday, Lord willing, I will teach four hours daily at the Hmawbi Bible School in a jungle setting. Next Sunday, I am scheduled to speak for the congregation that assembles in the home of Kyaw Sein. Monday through Friday of that week, I will teach two hours in the Hmawbi neighborhood of brother Sein and two hours at the school each day. The following day, Saturday, I fly to Sri Lanka. If it isn’t working for the Lord, it is not something that has much meaning to me, especially these days. Slowly, my grief is becoming a little more manageable, particularly as I devote myself to the tasks outlined above that lie before me. I’m on a journey, and this earth is not my home. Sometimes I stray from the pilgrim pathway (like any other mortal), but I am determined to maintain my focus on the heavenly horizon toward which I am marching. There are persons there who I earnestly long to embrace – Bonnie Sue Rushmore, but more so, God the Father, God the Son, God the Holy Spirit, the angelic host and the redeemed of all ages. Come, go with me – hand in hand! Comments: Comments Off on What’s Not to Like?